Here at NW Running Boards located just out of Portland Oregon, our digital shelves are stacked high with the top name grille guard and bull bars in business, including grille guards and bull bars from Aries, AVS, DeeZee, Steelcraft, Rampage, Go Industries, Go Rhino, Smittybilt, Nasta, Putco and Westin. What’s more, a grille guard or bull bar can give you both piece of mind and stylish looks. That’s because grille guards and bull bars not only protect your vehicle and look great, but they also safeguard your most precious cargo: you and your passengers. All of our grille guards and bull bars boast heavy stainless steel construction and are available polished or powder coated. 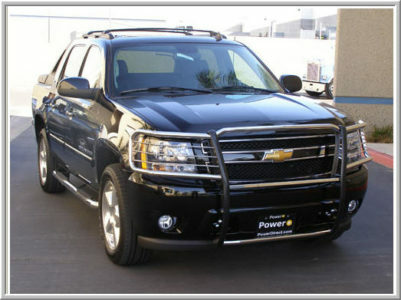 Most grille guards and bull bars use bolt-on installation and it often takes less than 60 minutes to be up and running. 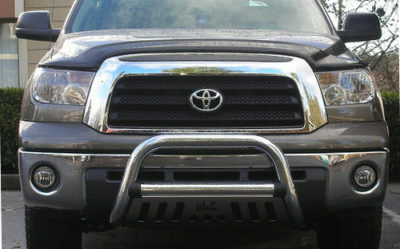 Brush Guards provide customized front end protection for the headlight and grille areas of your truck or SUV. All of the Brush Guards we offer are vehicle specific and are installed on your vehicle with a no drill application. There are several styles of Brush Guards such as Stainless Steel, Chrome Stainless Steel, and Black Mild Steel. If you are looking for an aggressive look that also provides the protection you require than a Brush Guard is exactly what you are looking for. We have available models from Westin, Warn and Smittybilt.